What was meant to be a relaxing weekend for two turned into mud. We decided to take a nice romantic weekend for two up to Harry’s Hut just north of Noosa. The traffic was terrible as we attempted to leave the city. The intention was to leave early to miss the mass exodus of citysiders leaving Brisbane for the weekend. Unfortunately our planning was for nothing as we were caught in the mass crush of vehicles for over an hour. On top of this a constant rain was coming down heavily, which probably should have been a sign. Eventually we got free of the jams and entered into more country areas. 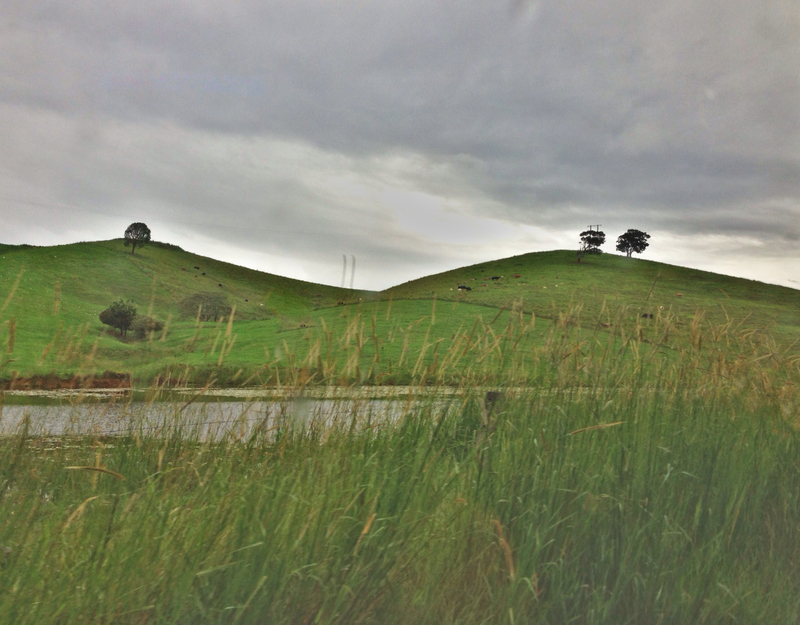 We drove through tiny pockets of settlements, a number of isolated properties and rolling green hills. I wonder, while we drive, what it would be like to live in these tiny pocket towns so far away from the city and isolated in nature? How do these tiny little towns survive? Where do people work? As the case seems to be with all of our trips, the GPS got us lost. It took us down a road which turned out to be a dead end. There were no sign posts, nothing. I programmed the GPS to find an alternate route which we followed. The total lack of signage ensured that we didn’t know if we were even on the right road or heading in the right direction. 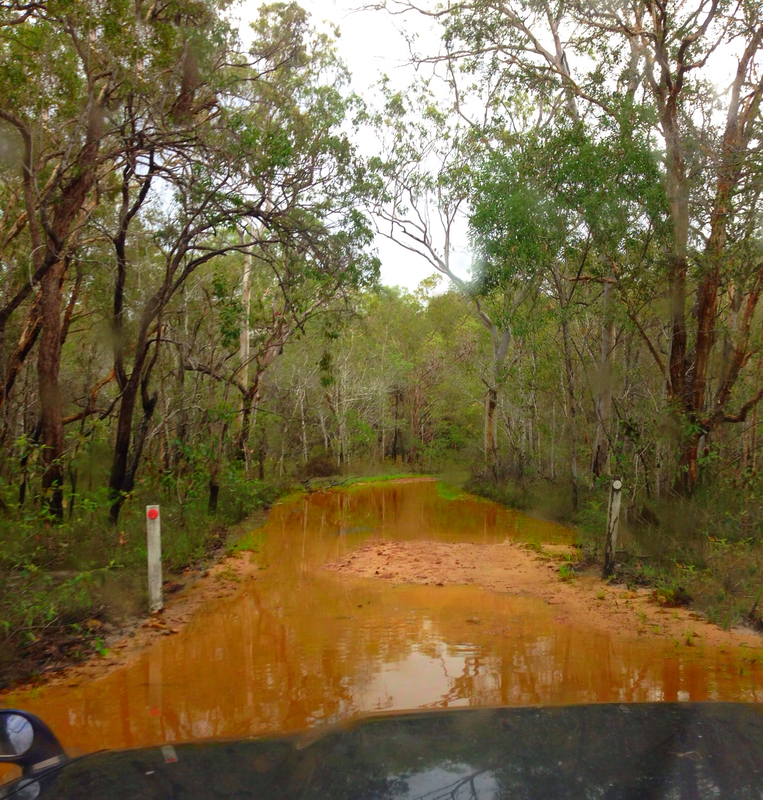 We slid around on a clay packed road (Johny was in 4WD heaven) and then turned onto a forest track. By this time is was getting dark. 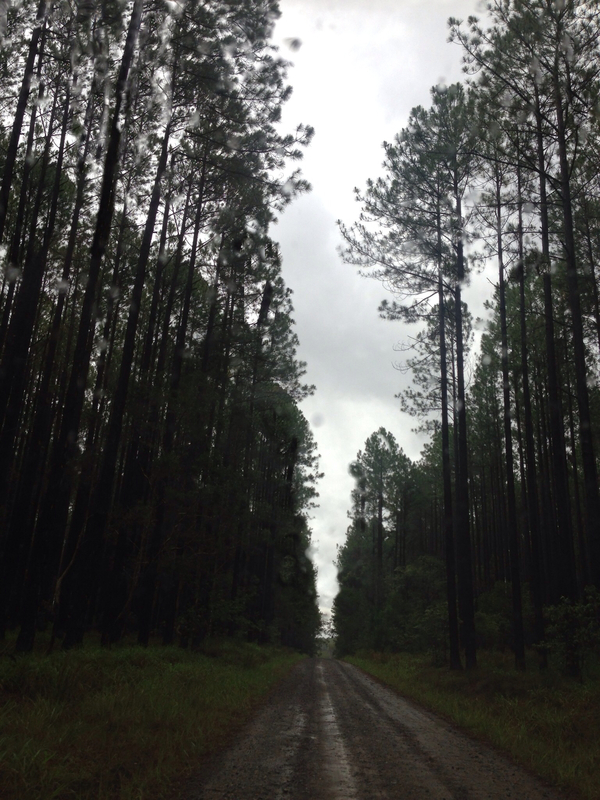 On either side of the wet pot holed road were tall trees, the scene looked like something out of a horror story. We drove through long vine tentrils hanging thickly down the middle of the road hitting the windscreen as we drove through. Our progression was long and slow going through puddles of unknown depth splashing the windows as we drove through. Always in the back of my mind was the fact that we mightn’t have even been on the right road and there was no option to turn around, we just couldn’t fit! Eventually in the pitch black we came across a campground. We drove through slowly, no street lights here to guide us, and allocated ourselves a site. Completely stressed out by this stage we managed to set the tent up; dinner was and informal fare of cheese, wine and a few games of Blitz followed promptly by sleep. It rained on and off during the night. Camping in the rain is an interesting experience. The sound of drops hitting the canvas on and off, hard and soft, in patches or constant; and it is loud, so loud. Thankfully there was no storm, no wind, just heavy rain. We awoke early, as you do when camping, to the sounds of the bush. Native birds, insects and frogs. People moving about, the camp was stirring. We set up the annex area of the camper; cooked some breaky on our new Weber and took the kayaks down to the river. Even though we had never been to Harrys hut; we could see that the river had risen significantly as the jetty was completely under water. This didn’t deter us and we took the kayaks onto the river. As we are novices we never take the kayaks far; but, we didn’t have to, we were completely alone. The river looked like a large container full to the brim of water. There were no dry, parched banks; everything was full to the top. On our return the Park Rangers had arrived. Tewantin, further up the river, had a lot of rain overnight and the water was coming our way. They had been instructed to ask all of the campers to move out. So with a soggy heart we packed up our little campsite which we had just set up and drove ourselves out and back home. This entry was posted in QLD, Reviews and tagged Brisbane, camper trailer, Camps, Flood, Global Positioning System, GPS, kayak, outdoors, Park ranger, Puddles, Recreation, River, rolling green hills, Romantic weekend, Traffic sign, weberQ on March 17, 2013 by monicabugno. Explore how public figures and media organizations are using Facebook in extraordinary ways. Engaging the community, developing your skills and creating content in a fun, enjoyable and amiable.